2 cuts from the O.S.T. album, plus one bonus song + instrumentals! 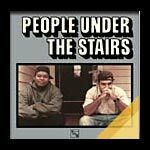 Produced by People Under the Stairs. All scratches by Double K.